If you hit the hyperlink you will go to the original proposal made by Tim (now Sir Tim) Berners-Lee to CERN, the organisation he was working for at the time. These quotes show just how different our views on the power, influence and goodness of the net is. In many ways I agree with them all. It can be a waste of time, it can be dangerous, it can lead to the decline of family interaction. It can also be a means for incredible communication, it can provide a source to have the world of knowledge at your fingertips instantly. I am retiring soon and will be trying to spend a part of my time helping people who know little about the net to access its wonders, to find online bargains, to communicate with their cousin in Australia, to search into the history of their family. I believe that it does open up many many opportunities.. but as Eric Schmidt said in his quote it is anarchic, we don’t fully understand it and we don’t really know where its going and how it will change us… but I would really love to be around in 21 years time to find out! 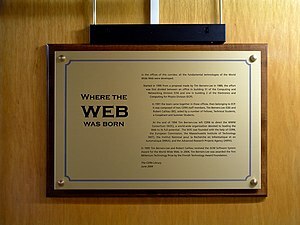 This entry was posted in Digital Technology and tagged Tim Berners-Lee, World Wide Web. Bookmark the permalink.